The word Fried Rice doesn’t always conjure up images of health food – but there’s no reason it can’t be a delicious and healthy dinner choice. The first thing is to change white rice to brown if you haven’t already made the shift. White rice has very little nutritional value since the bran is removed, so basically our bodies process it quickly as a sugar source, causing an insulin spike, and that’s just no good for anyone. If you eat a lot of fried rice, then switching to brown rice will do your body a big nutritional favor by adding a nice dose of healthy fiber along with along with significant amounts of magnesium and vitamin B6, and small dose of iron. Pretty great, hey? 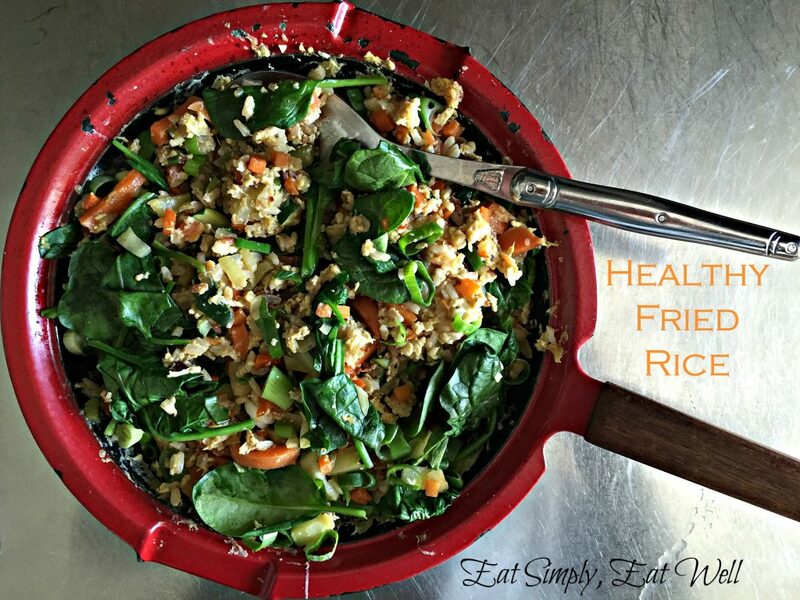 This fried rice recipe is also loaded with cooked, steamed and raw veggies for to add flavor, texture and nutrients, as well as eggs for protein. 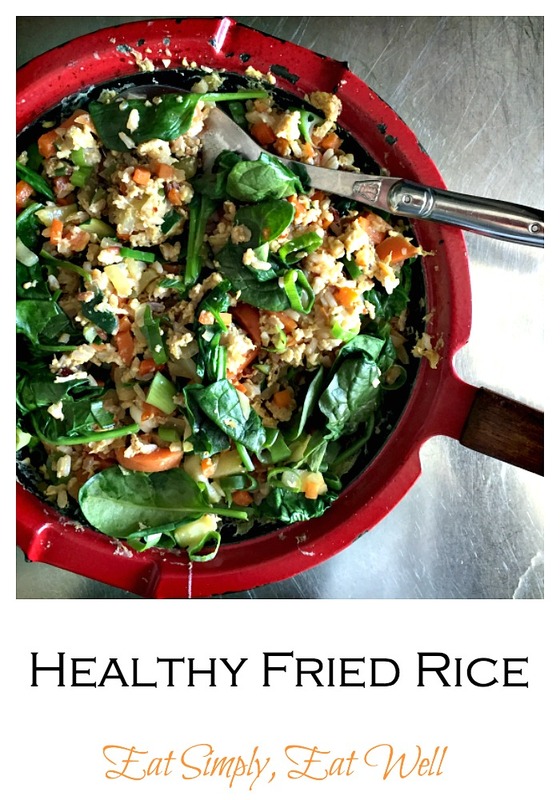 Even better – this fried rice recipe is super fast if you have cooked rice ready to go. Here’s a tip: whenever you make brown rice, make a big batch and freeze it in 1 cup /2.5 dl portions so that you can thaw it quickly and add it to dishes like this one, soups, or serve it up with some simple stir-fried vegetables. It’s away to make fast food at home in little time and still control the ingredients that go into your food. We enjoyed this dish on a sleepy Sunday afternoon after a morning spent outside, and it literally took 15 minutes to make the entire thing – which means you can fit this into your schedule any day of the week and ensure a healthy dinner that everyone will love. Which means pretty soon there will be a bounty of fresh veggies coming out of gardens and farmers markets. Here’s the perfect way to use them up. In a large, heavy-bottomed frying pan over medium heat, warm the oil and add in the onion and carrot. Cook for 5 minutes or until onions are translucent. Add the garlic and zucchini and cook 3 minutes more. Add the rice, eggs, salt and pepper and stir in well. Allow the mixture to cook, undisturbed, for 5 minutes, then flip the mixture over in small portions and cook for 2 minutes more. Place the spinach on top of the mixture and put the lid on. Steam the spinach for 1-2 minutes until just wilted. Add the green onion, stir the onion through the mixture, and serve. Did you like this post? Let me know in the comments below, and please share this with your friends! Have you signed up for the ESEW newsletter yet? If not, scroll back up to the top of the page and fill out the form at the top right to get the recipes and tips in your mailbox. This sounds super delicious! At which point are the eggs added? And what a great idea to freeze boiled rice to save time. Hi Päivi! Thanks for the note, and for pointing out that I’d missed the part about adding the eggs 🙁 They are added in along with the rice. The recipe is updated now! I hope you enjoy it. Regarding freezing rice – I do the same thing with beans too and it is so convenient to have them ready to go!